Welcome to the four hundred and seventy-fifth of my blog interviews with novelists, poets, short story authors, biographers, agents, publishers and more. 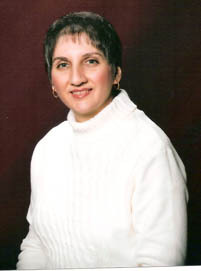 Today’s is with romantic suspense author Deborah M Piccurelli. A list of interviewees (blogged and scheduled) can be found here. If you like what you read, please do go and investigate further. Morgen: Hello, Deborah. Please tell us something about yourself, where you’re based, and how you came to be a writer. Deborah: Hello, Morgen. My name is Deborah M. Piccurelli. I write inspirational romantic suspense novels. I write from the state of New Jersey in the US. Although I started writing a couple books when I was a kid, no one around encouraged me to see them through. I strayed from that through my teenaged years, and early married years. After my two sons moved into the tween stage, I began to get interested in it again. I was always an avid reader, and reading great stories created a desire in me to also write them. Once I started, I was hooked! Morgen: You mentioned that you write inspirational romantic suspense, have you considered other genres? Deborah: I like to read many different genres, but romantic suspense is what I enjoy most. I did write a romance novella, once, but the publisher I wrote it for decided not to go through with the anthology for which it was targeted. That’s okay, though. Every bit of writing we do is worth the experience of learning more. Morgen: Absolutely. It’s all practice and you still have it for someone else. What have you had published to-date? Do you write under a pseudonym? Deborah: I have had one other book published back in 2004. In the Midst of Deceit is largely out of print, but there are a few copies left on Amazon. No, I do not write under a pseudonym. For the moment, I think it’s easier to keep my real name for purposes of income tax, bank accounts, and any other legal and business paperwork. Morgen: Including cheques from publishers and editors. 🙂 Not having your novella published must have been disappointing, have you had many rejections? If so, how do you deal with them? Deborah: Oh, my, yes, I’ve had a ton of rejections. It’s a little frustrating, but I don’t take them too personally. All writers get rejections, even well-established ones. I guess I’ve developed that thick skin they say all writers need to have. Morgen: It certainly helps. Have you won or been shortlisted in any competitions? Deborah: No. I’ve not won any contests, yet. I’m seeing some contests my book qualifies for. I’ve only entered one, so far. Morgen: Let me know how you get on and I’ll put in a footnote. 🙂 Do you have an agent? Do you think they’re vital to an author’s success? Deborah: I don’t have an agent, yet. I queried numerous agents for Hush, Little Baby, but none were interested in a novel that had to do with abortion. I do think they’re important, but I think there are some authors out there who have had success without them, or before they signed with one. Morgen: There are and I’ve interviewed many. 🙂 Are your books available as eBooks? Were you involved in that process at all? Do you read eBooks or is it paper all the way? 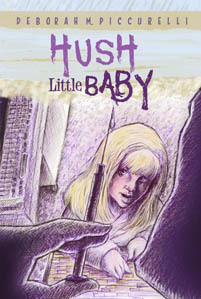 Deborah: Hush, Little Baby is available in Kindle, but the publisher took care of that. I had nothing to do with it. Back when In the Midst of Deceit was published, eBooks were having trouble catching on, but there was one available only through the publisher. Kindles weren’t around then. The publisher told me to have the book released in electronic format first made it easier to correct any mistakes that may have been missed. Morgen: They are. Apart from a short story in a charity anthology (and fiction / articles in magazines) all my writing has been on eBooks and a reader spotted a spelling mistake the other day where I had smelly instead of smell (funny how a rogue letter can make a word so different) – thank you, Jenny! I do read eBooks, but only because I’m a reviewer, and lots of those I’m asked to review are in the electronic version only. I do like the printed version of books so much better. Morgen: Ooh, I have a list of reviewers on my Reviews page – let me know if I can add you. 🙂 How much of the marketing do you do for your published works or indeed for yourself as a ‘brand’? Deborah: I do as much as I can, and am looking for new ways all the time. I strive to target an audience that might have a particular interest in the subject of my book. For example, with Hush, Little Baby, I’ve been aiming much of my effort at pro-lifers. In light of the hero and heroine being little people, I have been also targeting that community. Since the book is a romantic suspense, I also market to those who read the genre. As for marketing my brand, this is the first book that has been published since I’ve decided what it is. I write about dark issues, and my website reflects that. I’ve also had a newspaper article against embryonic stem cell research published in my local paper. Morgen: I’m not sure why but I’d not thought of targeting specific markets as you have. My only marketing (and I’m not that pushy) is general Twitter, Facebook etc at the moment but I do plan to go wider when my novels are available. It’s a good idea. Do you have a favourite of your books or characters? If any of your books were made into films, who would you have as the leading actor/s? Deborah: Since I only have the two books so far, I can’t say I have a favourite. They’re both my babies. As a favourite character in each of them, I have to say I lean toward the heroes. I think, for me, it’s more fun creating the male characters than the female ones. I don’t know if readers can pick up on that, though. Deborah: If Hush, Little Baby were made into a movie, I know exactly who would play the male lead: Peter Dinklage. I modelled Evan Blake after him from the beginning. But he’s a very busy actor. He’s in many movies, and is, and has been in lots of TV series. Right now, he is part of an ensemble cast in HBO’s medieval show, Game of Thrones. As for the female lead, I really can’t say. There aren’t a lot of little people who act, but there are especially few actresses. Maybe by the time the movie is made (wink), some new actresses will come on the scene. Morgen: I didn’t know Peter by name so had to Google him but I had a picture of who I expected him to be, and he was. Good choice. I met Warwick Davis when I was volunteering at Oundle Literature Festival last year – he’s really funny. Did you have any say in the titles / covers of your books? Deborah: Both of my publishers kept the titles I had given to my books, and I’m grateful for that. As for the covers, I had no say whatsoever in choosing the cover for In the Midst of Deceit. For Hush, Little Baby, I actually had to find my own photo for the cover. It was really tough to find something that fit such a story, but I did. The thing is, some people can’t identify the objects in the picture. As a result, I have decided to have an artist custom design a new cover for the book. Morgen: That’s a shame but they are what people go by so clearly useful for you to have had that feedback. What are you working on at the moment / next? Deborah: My current work in progress is another “issue” book. The heroine will also have a physical challenge to overcome, while dodging the villain(s). I can’t say any more than that without giving away important surprise elements. Morgen: Maybe you’d like to return for an author spotlight when it’s available. Do you manage to write every day? Do you ever suffer from writer’s block? Deborah: At the moment, I wish I could say that I was able to write every single day. Though I know I should do that (and hope someday to reach that goal), there are just too many things going on in my personal life that prevents me. It’s not a big problem since I am in the early development stages of my current work in progress but when I get into the real writing, where I need a momentum, I know the Lord will help me work it out so that I can get enough time in each day. I have not yet experienced writer’s block. What does sometime happen is I have trouble getting into development. Once I have the beginning, some scenes in the middle, and the end, the writing will flow for me. Deborah: I am a seat-of-the-pants writer, but I do plot out some things. I might put together a very rough outline, and then begin writing. When I say “very rough,” I mean just a list of things I know need to happen. Each item is usually no more than one sentence. Morgen: That’s what I tend to do because invariably the characters will take over. Do you have a method for creating your characters, their names and what do you think makes them believable? Deborah: No, I don’t have a method for creating characters. When the idea for a story takes root in my mind, and the characters begin revealing themselves, I get a feel for who they are. I do sometimes fill out a character chart, just so I have a record of their physical appearance and personality. By the time I’m ready to choose names for them, I usually have one in mind that fits them very well. Morgen: I find Google images or magazine photos useful, especially as I write more short stories than novels so have to make sure my characters look the same at the end of the novel as they do at the beginning. Do you do a lot of editing or do you find that as time goes on your writing is more fully-formed? Deborah: Yes, I do a good amount of editing, but I also try to make sure it’s the way I want it from the beginning, so there’s not as much to do later on. Morgen: Like anything, it’s practice. I find now that I know when I’m starting to waffle and reign it in. Writing a story a day helps because they are very tight (usually 200-400 words). Do you have to do much research? Deborah: I do as much research as each story requires. If I’m writing about something I’m already familiar with, then there isn’t as much research. But every story will have some elements that I know little about. If I want authenticity, I’ll do what I need to do to find the details. Morgen: It’s best to be confident about the finished result because there will always be an ‘expert’ out there ready to highlight an error. What point of view do you find most to your liking? Deborah: Currently, I like third person, but I may try first person in a future book. Morgen: Third is the most popular but I write a monologue every Wednesday and love it just being the protagonist and I. Do you have pieces of work that you think will never see light of day? Deborah: Yeah, a couple. But then again, nothing is unsalvageable. Morgen: That’s what I like to hear. My heart sinks when I hear of writers destroying something they’ve written because you do never know when it could be used (or certainly brushed up and used :)). What’s your favourite / least favourite aspect of your writing life? Has anything surprised you? Deborah: Although it is time-consuming, I’ve found that I enjoy the marketing aspect of writing. Surprises? None, so far. Morgen: That’s a (pleasant) surprise to me… that you enjoy marketing. It’s usually the answer to ‘least favourite’. What advice would you give aspiring writers? Deborah: Study, study, study the craft. There are a lot of ways to do that. Go to conferences and workshops, take online classes, read some how-to books by the experts, read writer’s magazines, join a critique group. The more things you do to hone the craft, the better the chance you’ll have to make your writing shine. Morgen: Absolutely, and practice. I run a fortnightly writing workshop and put the tasks on my exercises page so others can have a go (and they occasionally tell me that they do!). If you could invite three people from any era to dinner, who would you choose and what would you cook (or hide the takeaway containers)? Deborah: I know one person I would definitely choose would be Jesus. I’d love to sit at His feet the way Mary of Bethany did, and listen to Him speak about the Kingdom of Heaven. I would make him my homemade lasagne—noodles are made from scratch! I can’t think of anyone else, at the moment, because no one else measures up. Deborah: Yes, I am on a number of networking sites: the usual ones, like Twitter and Facebook. Then there’s Goodreads, Plaxo, ShoutLife, LinkedIn, Book Marketing Network, Edgy Christian Fiction Lovers, a whole bunch of Yahoo online groups, and on, and on. I don’t have any statistics on how well they work for writers as a whole, but I think they work to some degree. Morgen: I’m sure they do, and some will work better than others for different people. It’s all networking with other writers and potential readers. The downside, as you said a moment ago, is the time aspect. They can eat hours whole. Where can we find out about you and your work? Deborah M. Piccurelli is an advocate for sanctity of life, and tackles such issues in her novels, weaving them into compelling stories. She lives in New Jersey with her husband, their two sons, and their Yorkie-Coton puppy. Loved this book and love this author! Thank you, Michelle! As you know, I love you, and all your books, too!